16 ounce No Garlic Hamburger Dills are cut into chips. 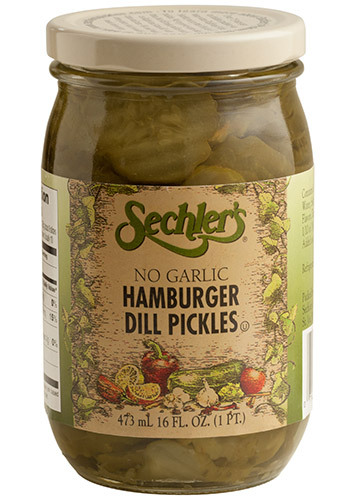 Made from dill pickles, they are a great addition to any sandwich or burger! From Dorthy Eagleton of Oswego, Illinois on 12/29/2018 . As always Sechlers pickles are as good as in the past containers!!!! THE WAY A PICKLE SHOULD TASTE ! BEST TASTING PICKLE IV'E EVER HAD. From Barbara smithson of Bristol, Tennessee on 12/10/2017 . Not sure where I picked up my first jar of Sechler pickles. Made potato salad with them and there was a very noticeable difference for the better. It should say a lot by the fact we were willing to purchase them on line and pay shipping to have more. Have searched and cannot find them in a store close to us. Please consider us as a new market. From BRIAN BELLAND of BOYNTON BEACH, Florida on 11/19/2017 . From Anonymous of New York, New York on 11/2/2017 .